Financial statements report on the financial condition of the Town as at December 31 each year, to ensure accountability and transparency. They also assist municipalities with long-term and strategic planning. Financial statements are an important tool for a municipal council and administration to use to report to the taxpayers. It is important for taxpayers to know about the municipal services provided with the resources at their disposal that their tax dollars support. 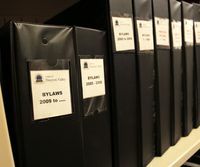 The Municipal Government Act (MGA) requires that every Alberta municipality complete annual audited financial statements, a copy of which must be submitted to Municipal Affairs, by May 1 of each year. The financial statements must be prepared in accordance with generally accepted accounting principles for municipal governments in Canada.